I took pictures of the setup at the March 2012 CNPS Chapter Council meeting at the Rancho Santa Ana Botanic Garden in Claremont to provide some examples of past practice in hosting a Chapter Council meeting. I'm providing my own view as an attendee of recent CC meetings. My intent is to provide context for those making hosting arrangements for future meetings. Ours is a healthy eating crowd, so there are lots of healthy breakfast choices (and a few indulgences), a variety of fruit, and many organic items. Fruit selection is seasonal, but grapes are popular and practically always provided. Sometimes we get fruit from people's trees and homemade baked goods. Most of the coffee is caffeinated to help people stay awake during the meeting. Cutlery, napkins, cups, etc. are compostable or recyclable. CC Vice Chair Larry Levine sits in the middle of the room using a laptop and projector. 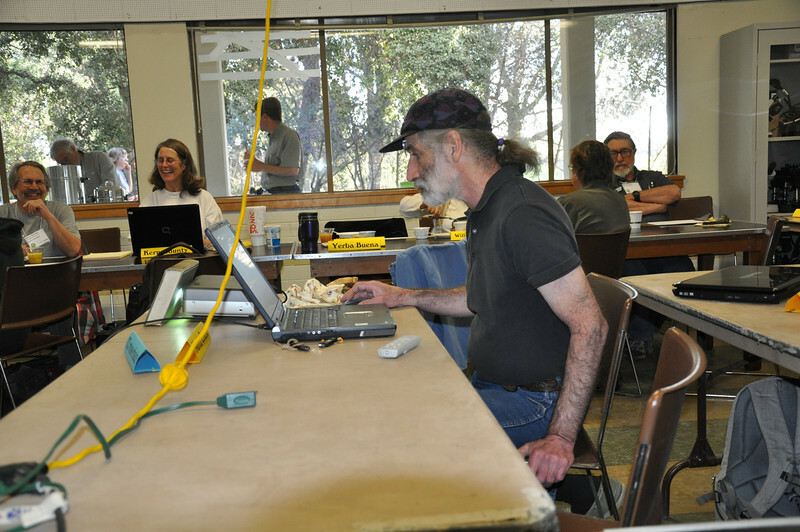 He also gets the the information needed to allow attendees to use WiFi connections. This may require some communication with facility staff and some troubleshooting skills. If a password is needed to use the WiFi system, Larry writes it on a blackboard.